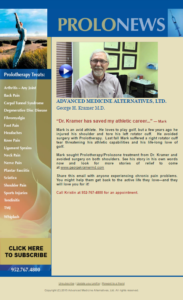 ProloNews Newsletter – August 2015 | George Kramer, M.D. I’m sharing this with you because so often the most popular treatment offered to joint pain is the corticosteroids pathway. In my opinion and that of others like the Mayo Clinic, have found reasons to be cautious about this method of treatment. Here’s a summary of a recent study for you to read and contemplate. A study at the Mayo Clinic has found that corticosteroids, commonly used as a short–term anti–inflammatory and analgesic for the treatment of musculoskeletal disorders, may be cytotoxic to mesenchymal stem cells (MSCs), the direct progenitors of chondrocytes and other musculoskeletal tissue. The authors of the study concluded, “Corticosteroids frequently are used by physicians to reduce inflammation in patients with musculoskeletal disorders, but these agents may hinder the innate regenerative capacity of mesenchymal stem cells in exchange for temporary analgesia.” However, the researchers’ findings suggest that dexamethasone may be less damaging than other corticosteroids. A separate study, retrospectively conducted at the University of North Carolina at Chapel Hill, investigated the effects of corticosteroid injections in patients’ hip joints and found that 32 out of of 33 consecutive patients (97%) showed marked decreases in joint space width, visible on standard radiographs, just six months after injection with corticosteroids and lidocaine. Bone–on–bone degeneration developed in nearly a third. On average, patients experienced a 52.25% (0.18 mm) decrease in joint space width (JSW) at the superomedial aspect of the joint, and a 43.87% (0.14 mm) decrease in JSW at the superolateral aspect of the joint. Previous studies have already shown that corticosteroids may have a deleterious effect on chondrocytes, suggesting a potentiation of degenerative joint disease. 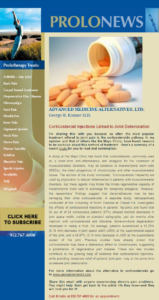 These two new studies contribute to the growing body of evidence that corticosteroid injections, while providing temporary relief of patients’ joint pain, may at the same time accelerate joint deterioration.